Did you know that if you perform 30, 40, even 50 minutes of slow and steady cardio day after day that, over time, it can actually make you GAIN fat around your belly, your thighs, and your legs? I know it may sound hard to believe, but studies are now proving people who perform long bouts of chronic cardio suffer from decreased thyroid function, release more of the stress hormone cortisol, and increase their appetite - all at the same exact time. In fact, research shows people eat at least 100 MORE calories than they burn off after performing cardio. Now here’s the REAL scary part. Did you know that chronic cardio and jogging could even damage your heart? Sounds crazy, but your heart is a muscle and when it’s overworked with old-school cardio it can do more harm than good. Did you also know there is a quicker, more effective and proven method you can use instead so you never HAVE to suffer through another long and boring cardio workout ever again? It’s not interval training, it’s not spinning, and it’s not some "insanity" workout that puts all kinds of stress on your joints and takes you 45 minutes. In fact, you can use the science based exercise protocol below to force your body to release the fat-burning hormones that legitimately, “target” lower belly and abdomen fat in as little as 12 measly minutes. All you have to do is follow the simple protocol below to ensure that EVERY time you exercise you’re avoiding all the negative side effects from above. This isn’t another hyped up exercise gadget or gimmick. It doesn’t require any fancy equipment. And it works for everyone. Regardless of your age, your gender, or your current condition, you can visually “see” your belly get significantly FLATTER in as little as 7 short days using this approach. My name is Shaun Hadsall, and I’ve spent the last 15+ years of my life MASTERING the science of removing lower abdominal and belly fat. I’m known as “The Stubborn Fat Expert” and I put together this article for you because I’m so passionate about helping others learn the truth about real fat loss. Believe it or not, it’s really quite simple. But I do have to warn you. What you’re about to read below will NOT be the same advice you get from your local personal trainer or exercise guru. That’s because the entire weight loss industry has programmed everybody into thinking that they need to stay in the “target heart rate” zone and track how many calories they burn DURING their workouts. This is a LIE. Target heart rate cardio has its place and may work initially, but it only takes a few short weeks before your body adapts and it loses its effectiveness. The 12 minute sequence below reveals EXACTLY how you can FORCE your body to release hormones that “burn off” stubborn fat... and it will only take you 7 short days to reprogram your metabolism to go get fat FIRST every time you exercise to quickly burn off belly flab – WITHOUT using long, boring cardio workouts. Just in case you didn’t know, your body is smart. SUPER smart. And it can adapt very quickly to old school weight loss methods. There’s actually a name for it. It’s called the “Adaptive Response” and it can be your greatest fat burning enemy unless you know how to overcome it. If you’ve ever experienced a weight loss plateau, then you know exactly what I’m talking about. It’s usually pretty simple to lose the first few pounds. But then it gets tricky and requires more of a strategy as your body starts to adapt and plateau. And you’ve probably discovered (like I did years ago) that fat loss pills, crash diets, endless cardio and infomercial gadgets are ineffective, outdated, and pretty much a waste of time and energy. In fact, these methods are the primary sneaky culprits that are responsible for thousands and thousands of people gaining their weight back after they lose it. Believe it or not, your body will even “adapt” to trendy interval training if you’re not careful. However, the efficient exercise strategy below is specifically designed to burn off stubborn fat, flatten your belly and eventually get your lower abs “popping” out – WITHOUT ANY type of exercise adaptations or weight loss plateaus. You can discover exactly how to apply this strategy so it works in synergy with your diet on the next page. Unfortunately, the exercise industry has gone soft. Whether it’s toning classes, yoga , 5k races, Pilates, or "core training" – all these things are “healthy” for you, but they’ll never flatten your belly or release the hormones that keep you young and burn off stubborn fat. It doesn’t matter how old you are, or what your current condition is, or what limitations you have – unless you learn to apply proper intensity on YOUR body, you’ll NEVER see your belly get flatter or slow the aging process. I’m not saying you should go all-out and risk injury, but learning to push yourself for short, hard bursts is by far the most efficient and effective way to force your body to release fat burning hormones. No, it’s not easy. It will require some consistency and a little effort. But you can do it in as little as 12 short minutes. I show exactly how to apply this technique on your stubborn body fat below. Traditional intervals typically last 60 seconds all the way up to 2 minutes in length. 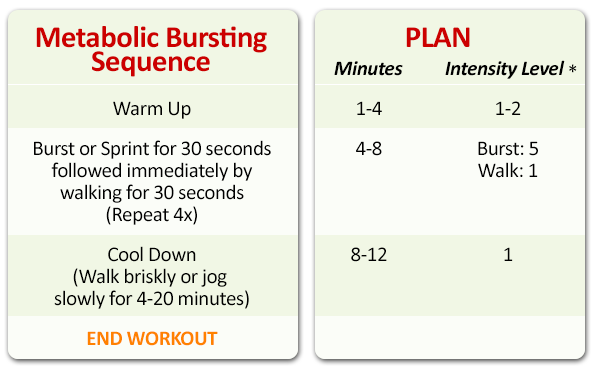 Metabolic Bursting is shorter in duration (10 to 30 seconds max) and harder in effort. It’s simply a very hard, short burst of exercise (sprinting, jumping, cycling, bodyweight exercises, even your favorite cardio machine) followed by an active recovery period to let the heart rate come back down before repeating another metabolic burst. This approach is NOT traditional interval training that’s become so trendy over the last few years. In fact, these short, brief, high intensity exercise bursts trump old school cardio (and even traditional intervals) everyday of the week. Using this approach can make a dramatic change in how your body looks because they release unique hormones called Catecholamines. Catecholamines are "fight-or-flight" hormones released by the adrenal glands in response to stress like high intensity bursting. They are part of the sympathetic nervous system and they force the release of free fatty acids into the bloodstream. Catecholamines eventually convert to dopamine, to norepinephrine, and eventually to epinephrine, which ultimately forces fat to be burned. In other words, these catecholamines break apart stubborn body fat. This is just one of the many reasons why metabolic bursts are so much more effective for fat loss than traditional exercise and old-school cardio. They save you time, are extremely efficient, and burn way more residual fat. 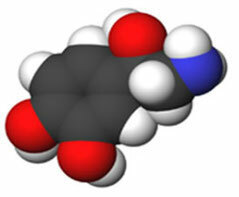 They lower insulin, raise Growth Hormone – GH, and force the release of powerful brain chemicals – mentioned above. They provide the greatest "after burn". Strategic high intensity bursts have the potential to increase your metabolic rate for 38 to 48 hours after doing just ONE 12 to 20 minute session. Pretty amazing. The scientific term for this effect is called EPOC which stands for Excess Post-Exercise Oxygen Consumption. They’re challenging and fun which can increase your brain power and prevent exercise boredom. They’re one of the greatest stress relievers on Earth. They increase blood flow for faster fat loss in those hard-to-get-rid-of stubborn areas like lower abdomen fat and even pockets of cellulite. As you can see, the benefits of this approach go WAY beyond the scope of traditional cardio exercise or interval training. I know this might sound like it’s a little more advanced, but I’ve dissected, researched, and applied this protocol on my private clients for years now so average people like you don’t have to try and figure out all the scientific jargon. Your 12 Minute Protocol to Legitimately "TARGET"
In Part 1 of your 7 Day Ab "Targeted" Cardio Sequence below, I’m going to introduce you to a 12 minute protocol that will literally FORCE YOUR BODY to release catecholamines. This protocol is the catalyst to “break apart” stubborn fat and release tons of free fatty acids into the bloodstream, which is great way to target the lower hard-to-get-rid-of belly fat and bust through an exercise or diet plateau. Warning: The protocol below is typically not for beginners. Make sure you’ve conditioned yourself previously with normal exercise on a consistent basis and make sure you’ve been cleared by your doctor for higher intensity exercise. Just add the protocol below to your routine two or three times per week and you’ll visually notice a difference in as little as 7 short days. *Intensity levels are different for every person and are based on your current condition, age, gender, or other limitations, so please gauge your intensity level based on where you’re at right now personally. Immediately after you finish these high intensity bursts or even strategic body weight circuits using this protocol, free fatty acids will literally pour or "dump" into your bloodstream. This is where you can incorporate a sneaky strategy to burn them off, which can mean MORE fat loss. If you’re not careful, research shows these fatty acids float around and can literally move from your upper body to your lower body (or somewhere else) and just be RESTORED as body fat again. Weird and wacky – I know, but the human body is designed to be a survivor. So your body will do whatever necessary to protect itself by HOLDING ON to more fat. Make no mistake about it. 99.9% of exercisers who don’t have access to this information will hit adaptation (i.e. 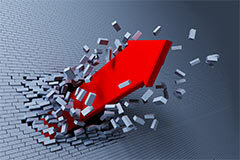 a weight loss plateau) and STOP losing fat. But I approach fat loss completely differently from almost everyone else. Like 180 degrees opposite. That’s why I don’t spend an hour in the gym day after day. I’m just like you. I have a family to take care of and I’m busy. The 7 Day Ab "Targeted" Solution is how I cut my exercise time in HALF and maintain under 10% body fat year round, while still having a life. Macro-PatterningTM, that’s specifically designed to work in synergy with my 7 Day Ab “Targeted” exercise solution to DOUBLE your results. CAUTION: THIS 7 DAY TARGETED PROTOCOL IS NOT FOR EVERYONE! If you still think that low carb diets, trendy workouts, long bouts of cardio, and chronic jogging are the only way you can lose stomach fat, than Macro-Patterning™ and the 7 Day Ab “Targeted” Exercise Protocols are definitely NOT for you. However, if you’d like to learn exactly how this solution works, just click the “Next Page” button below and you’ll discover a unique nutrition and exercise formula that work together synergistically to make lower abdominal and belly fat your PRIMARY energy source. It’s PROVEN safe, effective, and it’s one of the surest ways to visually seeing your belly get significantly flatter in just 7 short days WITHOUT long, boring exercise sessions or worrying about permanently damaging your metabolism with another low carb crash diet.